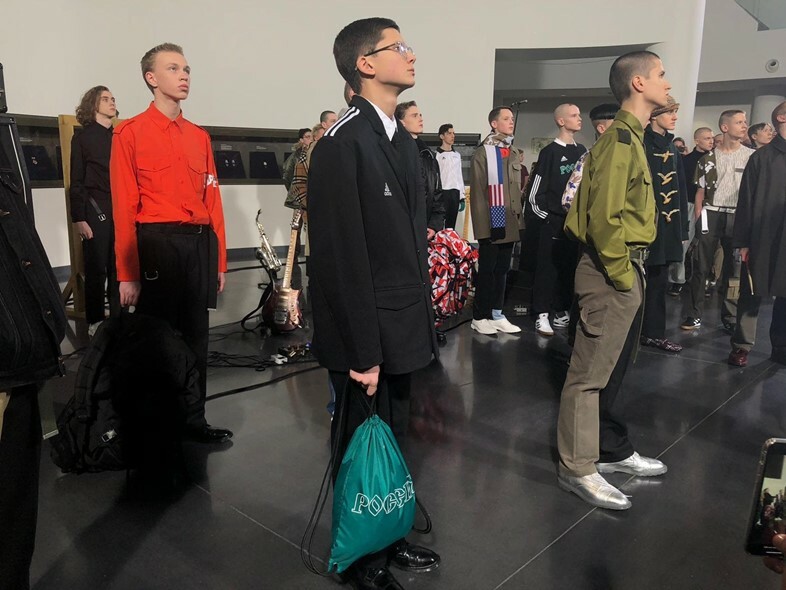 Today, Gosha Rubchinskiy put on a show that marked the third and final instalment of a great Russian tour that started in Kaliningrad for AW17, travelled to Saint Petersburg for SS18 and finished in Yekaterinburg for AW18. Here’s what went down. “Where? !” you ask? Although you might not be familiar, Yekaterinburg is Russia’s fourth biggest city, and is nestled next to the Ural mountains which divide Russia from Asia. As with the locations of Gosha’s previous Russian shows, the city will be playing host to the 2018 World Cup come summer. It’s where the Romanov family were executed, and the hometown of Boris Yeltsin, the first democratic president of the Russian Federation. And yes, it’s literally the coldest place I’ve ever been to in my life. Produced by In Russia, it included essays about the city’s rock history, architecture, and Boris Yeltsin. A picture of the politician as a young man holding a football also appeared on a t-shirt which was gifted to attendees, tying together the sporting theme and location. A museum dedicated to the late statesman. 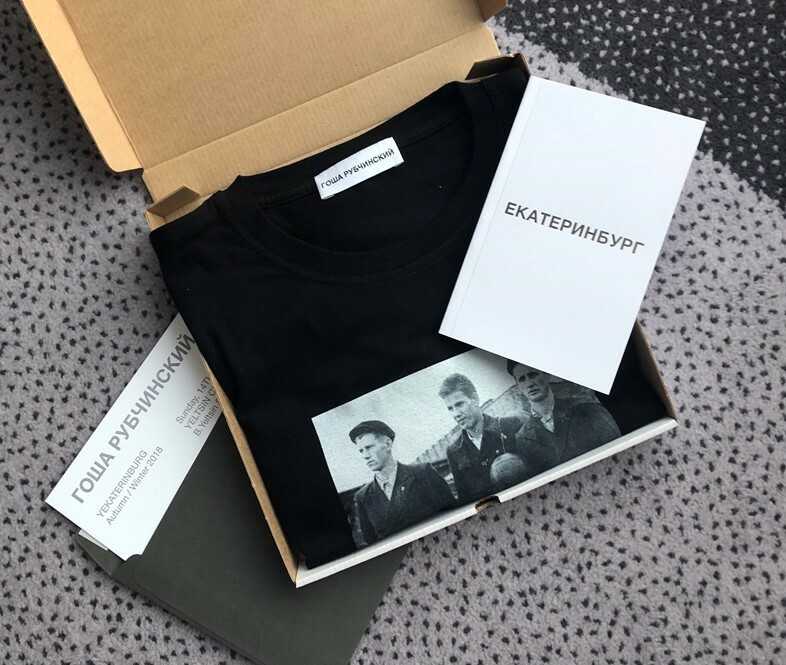 The staff were decked out in special Gosha t-shirts and tours were provided for show guests to learn about the collapse of the USSR and how Yeltsin’s rise to power ushered in a new era of trade, business and consumerism. (Bonus fact from my very informative tour guide Anna: when McDonald’s first opened in Moscow, 30,000 people showed up on the opening day.) 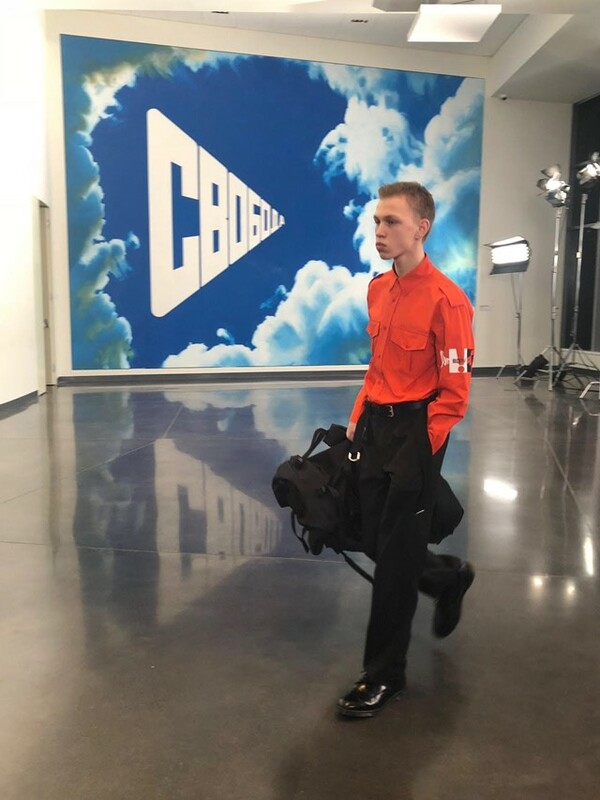 The show was also live-streamed (a first for Gosha) and his logo was projected on the outside of the building for local Yekaterinburg residents to enjoy. 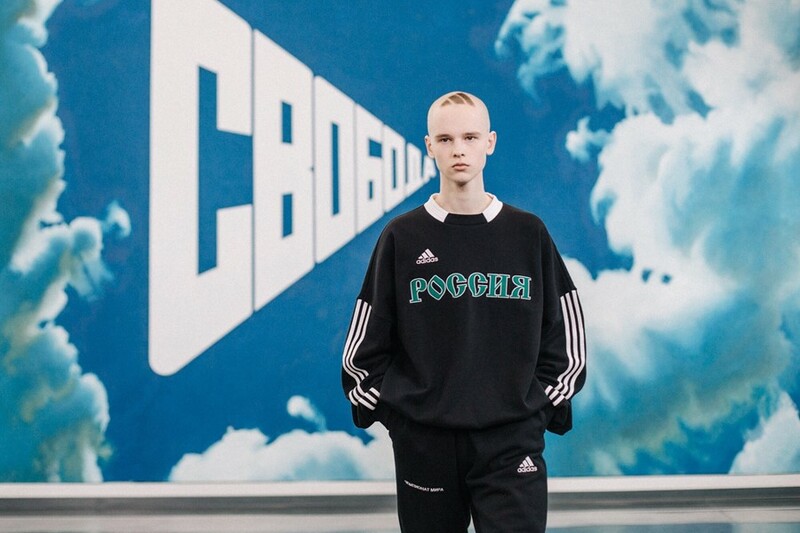 This is the third show Rubchinskiy has put on in collaboration with the German sportswear giant as part of the World Cup celebrations. Alongside the oversized sweatshirts and trackpants seen in previous collections, there was also a boxy blazer featuring stripes to the sleeve and signature trefoil logo to the chest (for when you have football at 8 but a desk job at 9, presumably). One model even had his hair shaved into the brand’s famous three stripes. The Burberry check was back for another season too, in addition to pieces designed in collaboration with Dr Martens and Levi’s. 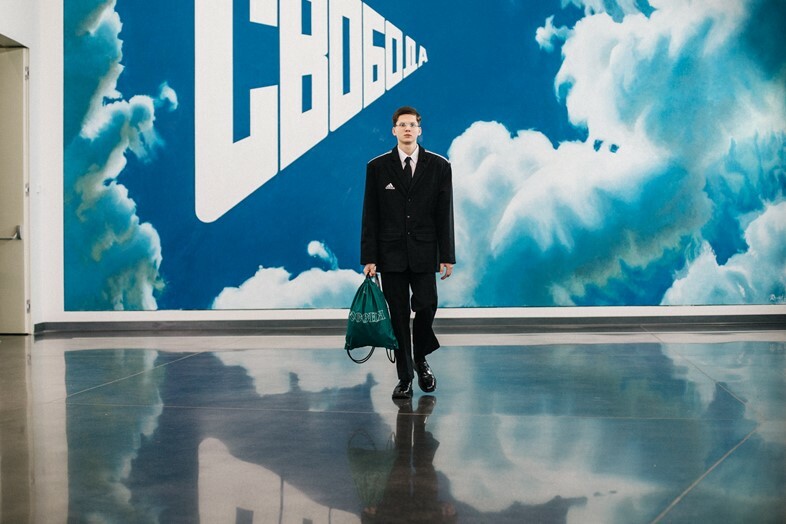 The models walked in front of a huge artwork by Erik Bulatov which read ‘FREEDOM’, as Gosha translated one piece by the pioneering Yekaterinburg-born artist (that hasn’t yet been seen by the public) into a series of motifs that offered variations on the phrase ‘a friend suddenly turned foe’. The future seems to be weighing heavily on the Russian designer’s mind; AW18 bears strong military influences as he presents a contemporary uniform for the next generation, in addition to a message of unity and openness. Moving away from the football theme that permeated his last few collections, Gosha is amassing his army. After walking out in front of Bulatov’s artwork, the models went into the museum itself – pacing inside the exhibits (like one of Yeltsin’s living room, for instance). Some stepped off the runway and picked up their instruments, playing loud and distorted music to the crowd as their fellow models stomped around them. The show culminated with them all rushing together in a mosh-pit like scene, before stopping still and singing an old Russian rock song called “Goodbye America”. Berlin duo Easter took to the stage of the museum’s built-in club (so Russia, we love it), performing a set filled with their hypnotic synth poetry at Gosha's post-show party. As for any karaoke booths, well... what happens in Yekaterinburg, stays in Yekaterinburg.